The fishing season last year was a success. We worked hard later in the fall, but our spring and summer season were simply spectacular. I couldn’t help but feel this year was like a return to the days of old on the Bighorn. A little mossy and off color in late fall, but tremendous BWO hatches in the spring, great nymphing all year, and we caught fish on hoppers all the way into October. I remember being out bird hunting, and coming back to the lodge at night and John said to me, “Hey Jeremy, we got 6-7 fish to eat hoppers today.” I about had a heart attack!! The water flow projections promise to have a continuation of the high water levels from last year. 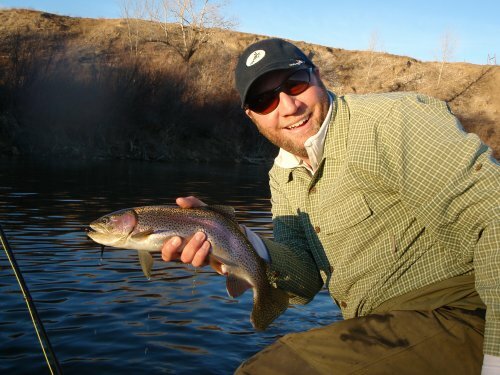 Snow pack is high once again, and with another year of good water, the river is going to be in great shape. It is amazing that the water levels have stayed this high all winter. What a true testement to mother nature!! 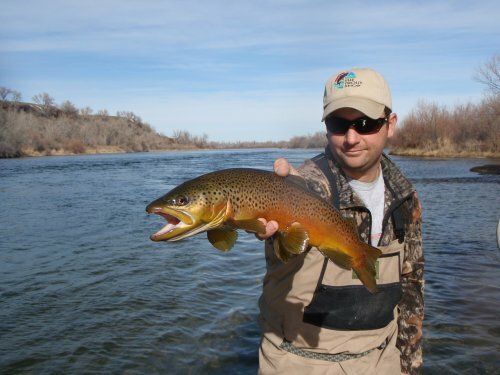 We will have increased flows, and increased numbers of fish for 2009. I would expect the numbers of catchable trout to be out of this world!! I would also expect a great blue winged olive hatch this spring, and also for our black caddis to be great as well. We are coming off what I would consider one of the best upland bird years we have had in quite some time. The sharptail numbers were up considerably, as were the pheasants. We had over 50 resident pheasants living in the field between the county road and the lodge every single day. Talk about tempting!!! I know it was hard for me to drive by them everyday and not want to get out and shoot at them. The satisfaction of seeing them in the sugar beet field every morning though, was all I needed to talk me into leaving them alone. I fully expect a wetter spring this year, growing more grasslands and upland bird cover. I would expect another great year of upland hunting hear at Eagle Nest. As always, our reservations are filling up quickly!! Prime times in the summer and fall are already booked, but we would like to encourage you to call anytime to check availability. Having recently been selected as the Orvis Fly Fishing Lodge of the Year, we expect to have one of our busiest years ever in 2009. Get out, cast a line, shine up your rods and reels, clean those guns and join a sporting clays league for this spring. It will be summer fishing and fall hunting season before you know it!!! Our entire staff is back and we are looking forward to seeing all of you in the very near future! !